Can hold 1 slab plus ice !! 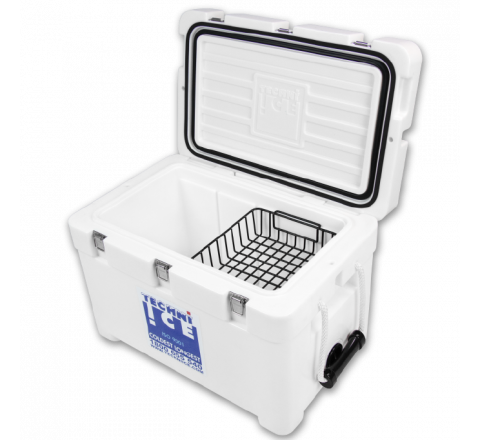 The Techniice Classic series is a genuine commercial specification ice box which has evolved over several decades and has an enviable track record of being used in some of the world's most challenging conditions by some of the world's biggest organisations spanning military, fire service rescue and food transport. 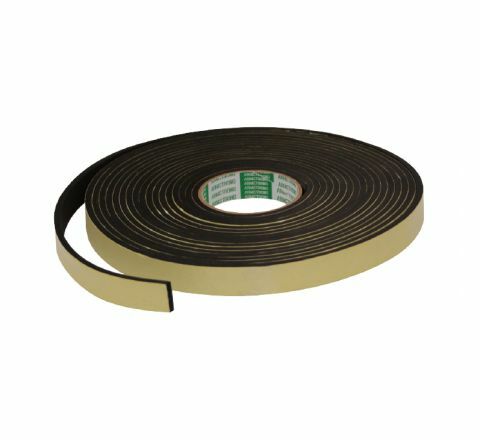 The Classic Series has been continually improved over the years and enjoyed many upgrades in tnsulation and plastic technology as they have emerged in the global market. 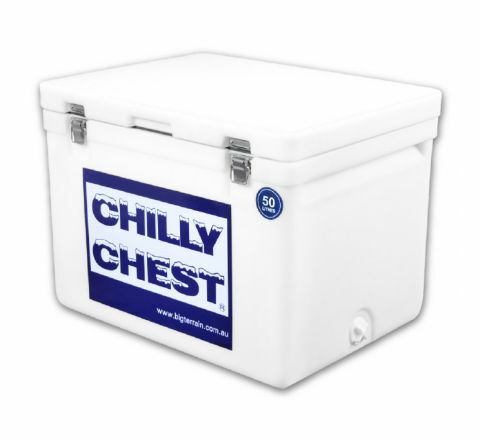 Although the classic series has it's origins in the commercial market, it has become Australia's favourite ice box for Australian family looking for a serious tough as nail high performance ice box. 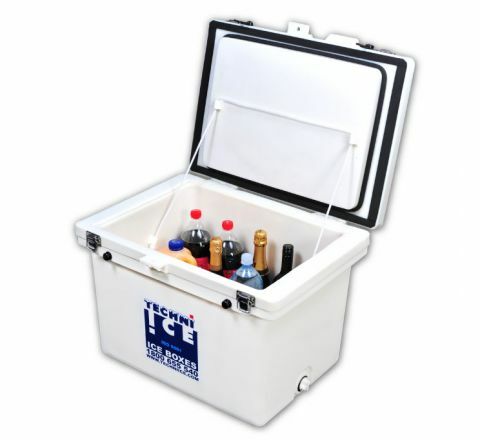 Techniice Classic Series Ice Boxes are built with the highest grade materials using a thick grade Polytheleyne Casing. Each box is hand finished to ensure correct case and lid intergrity and constructed to a build level that reflect it's lifetime parts and labour warranty. Techniice Classic Range of Iceboxes are designed with a NEW DUAL SEAL feature designed to create airlock between two seals. Techniice Classic Series Ice Boxes are designed with Handles on the Lid, which helps to lift the lid when there is undue suction from the vacuum in the box. Techniice Classic Series are designed with comfortable full length grab rails located right at the top of the box so that you don't have to bend down so far to pick up it up. 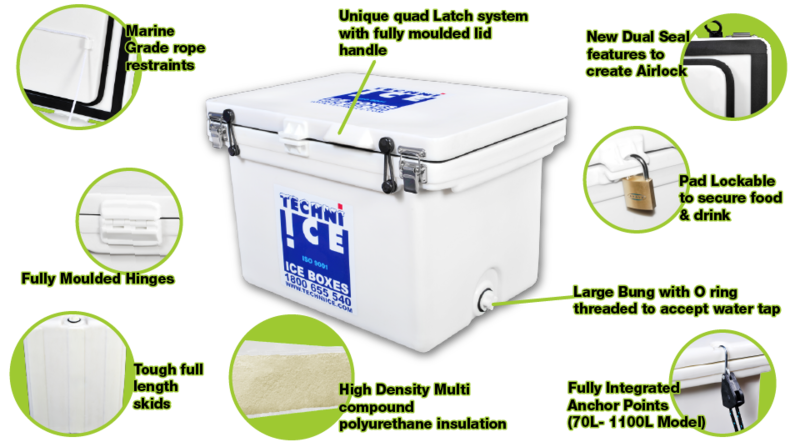 Techniice Classic Series Iceboxes are injected with HIGH DENSITY MULTI COMPOUND POLYURETHANE INSULATION injected under high pressure into the walls and double thickness lids for stunning Ice performance. The classic Iceboxes are designed with a PAD LOCK OPTION to secure your food and drinks or for secure storage when used as storage box. 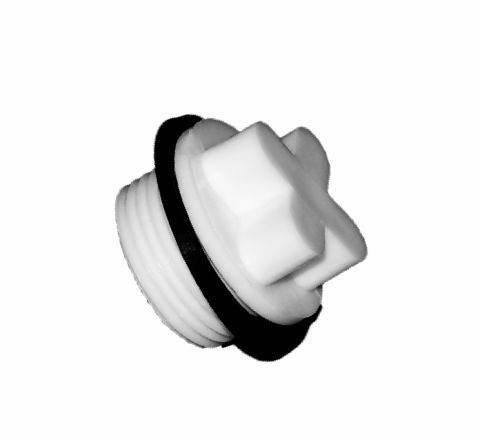 Techniice classic iceboxes come with a LARGE BUNG WITH ‘O’ RING threaded to fit a water tap to turn your icebox into a drink dispenser or garden hose fitting to drain water . 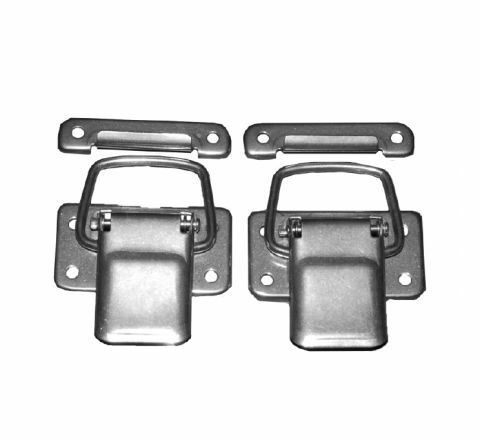 Techniice use a UNIQUE QUAD LATCH SYSTEM stainless steel latches plus Constant Pressure Pull downs for increased performance and lid stability over 32 °C. 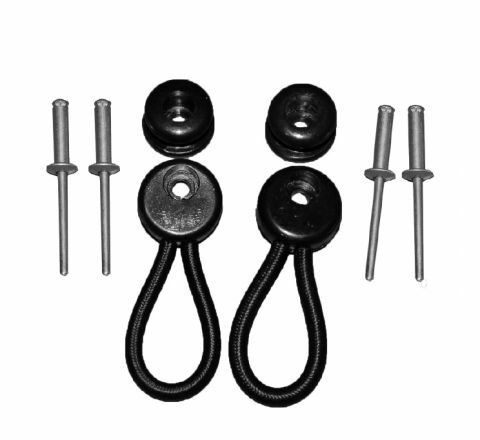 The Classic Model sports fully moulded hinges with corrosion resistant pins to withstand years of use in the tough Australian outback or out in the sea. For Additional Support the boxes come with MARINE GRADE ROPE RESTRAINTS to take strain off the moulded hinges when the lid is opened. Some companies don't offer these ropes to cut costs. The Classic Model Boasts a SEPARATE HIGH QUALITY FOOD GRADE INNER LINER to make your food safe from harmful chemicals . Costs more to make them like this but worth it. The Techniice Classic iceboxes come with DOUBLE THICKNESS LID to provide double insulation from the top where most radiant heat enters the Box. TOUGH FULL LENGTH WHITE SKIDS on the bottom on all models and additional side skids on 100Ltr model and above to prevent scuffing in trailers, Boats and roof racks. Techniice is the actual brand used by Department of Defence, CFA, SES, Police, Ambulance, Qantas, Air France, KLM, Dept of Primary industries, Royal Flying Doctor Service, McDonalds, Australian Navy, Air Force, Coles and thousands of other companies and government departments worldwide that require the highest level of cold chain performance and reliability.